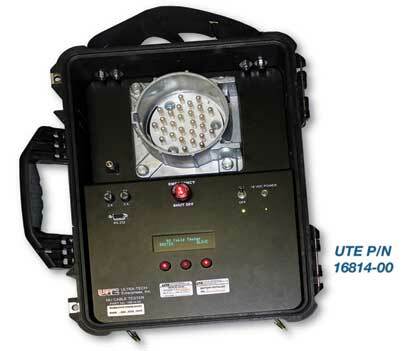 Ultra Tech Enterprises | Railroad Testing Equipment | MU Cable Tester System Welcome to Ultra-Tech Enterprises, a Railroad Testing Equipment Provider in Punta Gorda, Florida . The MU Locomotive Trainline/Cable Test System (MU Test System) can perform shorts testing, continuity testing, and ground-leakage testing on each of the 27 pin Multi-Unit Trainlines normally found on Freight Locomotives. The MU Test System is comprised of two identical tester units. Each unit is installed in a rugged, water resistant Pelican case. Each unit contains an MU cable receptacle that mates with a 27 pin MU jumper cable. A snap-on vinyl pouch on the outside cover of each unit provides storage for the battery charger/power adapter and the chassis test lead. The enclosure cover hinges separate from the test unit as the cover is opened; this removes the cover completely to allow free access to the MU cable receptacle and the control panel. 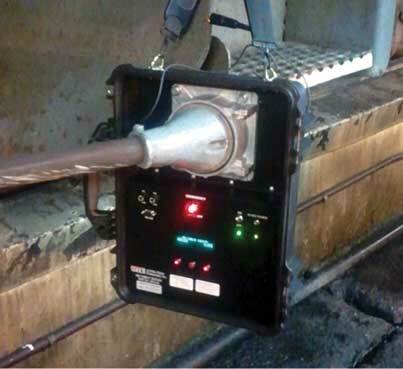 The MU test system is able to perform these tests on a locomotive or consist of up to eight (8) locomotives while they are powered and stationary. The MU test system is also able to test the 27 pin jumper cables, which are used to interconnect the locomotives. Typical equipment configuration for the MU Test System is the unit designated as a Slave unit connected to the other unit designated Master unit by way of the MU 27 Pin Jumper Cables. Up to eight Locomotives/ Railcars can be added between the slave and master units with nine (9) jumper cables connecting the entire consist. All MU Locomotive Trainlines and their 27 Pin MU Jumper Cables connected between the slave unit and master unit will be tested as a group.